Never understood that phrase, until I did that. I don't know if its the colder climate or the low humidity or perhaps the lack of crowd in Colorado in comparison with Ranganaathan street, I did not drop even after 14 hrs of roaming around on Black Friday. I knew a few things which I had to buy for sometime now and was postponing those for this day of the year. Visibly the discounts weren't that great this year if you zero'ed up on a specific product and wait for a slash on the price, Instead if one doesn't care for the brand or fine with lesser features then one might end up in a steal if one has the patience to stand in line 4 - 5 hrs in the cold for the doorbuster deals that happen when the shops open by 12:00AM. I was very specific on what to get therefore I didn't bother to brave the cold for the doorbuster deals. I started by 8:00AM and visited some furniture shops and then the factory outlet malls followed by IKEA and then the park meadow mall. Since these were in Denver/outskirts of Denver, it was visibly the Black Friday crowd, but in comparison to the crowds in NY/CA, it was considerable and thus I was able to shop around easily. As far as electronics is concerned I sealed up a solid deal for a 40" Sony - Google LED HDTV in Sony website. It was fun to visit so many shops in a single day and I think this is the first Black Friday wherein I contributed to the economy through my shopping spree. Finished the day with a visit to the local Best Buy to check around. There are few stories that is hard to believe, one such is the story of the expensive black pepper(Tamil: Milagu), the diminished usage of long Pepper(Tamil: Kandanthippali) and the rise of Chilli Pepper(Tamil: Milagaai). These 3 commodity's history and even their etymological namings in various languages are interwoven. The spice trade route in the high seas estabilished by the portuguese in 1498 paved the way for this. My interest in the Black Pepper was kindled by the Malayalam film "Urumi" and did some reading on Peppers. And so the story of Peppers unfolds. Prior to the Age of Discoveries, Black Pepper was native to Southern India(malabar region) and long pepper was grown in the North Western regions of India and these two were the only commodities to make the Indian cuisine hot. The european world prior to the age of discoveries used long pepper(imported from Northern India) for spicing up their cuisine as black pepper was very expensive and hard to import from South India. As the Romans thought both black and long pepper is from the same plant, they termed both as piper(actually derived from Tamil/malayalam root Pippali or Tippali) which became pepper in English. When Vasco Da Gama estabilished the sea route to south India in 1498, Black Pepper almost became like the Dollar currency in FOREX of these days. With the continuous flow of Black pepper to Europe, long pepper's stock was going for a nose dive :) It was during this time that the Columbian Exchange happened wherein the commodities, culture etc were exchanged by the Europeans with the Americas after the Columbus discovery of America in 1492. Now the third contender chilli Pepper (a native of America) entered the scene. The Europeans and Indians so far had known only Pepper as the source of Hotness in cuisine, therefore when they encountered Chilli, they named it based on pepper too, thats why it is called as chilli pepper (Tamil: Milagaai - Milagu(Black Pepper) + Kaai(Unripened fruit)) How intuitive!! When chillies entered India through the portuguese, it took us by storm it was far easier to cultivate than long pepper and all the cuisines made earlier with long pepper(the spiciest one at that time) was substituted with chillies. Probably is this the reason that we look up on anything foreign with awe, irrespective of whether they are the best in class or not? Right now, the only dishes in south India that I know that makes use of long Pepper is Kandanthippali Rasam and Deepavali Marunthu. That sealed the demise of Long pepper with chilli pepper and black reigning the supremacy across all cuisines. Looking back in retrospect, the traders around the world in the 1400's and 1500's were responsible for so many things associated with our cuisines/apparel/culture etc, Its hard to believe that we never knew about Potato, Tomato, Capsicum, Beans, Chilli, Custard Apple (Sita Pazham), Corn, Guava, Groundnut, Sweet Potato, Pumpkin, Pineapple, Papaya prior to 1500s. All these cam from Americas through Europe. I wonder what were we eating during that time? Some traces of foreign introduction of some vegetables and fruits are still evident in our life, for eg, During some festivals, rituals and Mangali ponduthal there is a rigid rule of what should be cooked. The curry would always be Vazhaikaai(Plantain) / Kothavarangaai(Cluster Beans) / Katharikaai (Brinjal) / Poozhanikaai (Ash gourd) / Avaraikaai (Broad Beans) / Podalangai (Snake Gourd) curry and all of them would be seasoned with coconut and not fried, Maanga(Mango) pachidi, Vazhaikaai (Plaintain) chips which clearly are made only with the indigenous vegetables and probably the rules were devised when the other vegetables existence was never known. These vegetables are also referred to as Naatu kaai (Country or local vegetables). Some vegetables and fruits never got a proper Tamil name(eg, Carrot, Beet root, Apple) and some got names referring to their history (eg, Pumpkin - Parangikaai : Parangi(Foreign) + Kaai(Unripened fruit)) Also, even though we embraced potato, tomato, guava et all with open arms, still in our house we avoid eating Pineapple, Papaya and Custard Apple giving it a suspicious look :) I hope someday there is mass production of Indian vegetables here in US, I miss the kothavarangaai, Avarakaai, Poozhanikaai, Podalangaai. I am tired of buying the same old Potato and Tomato everytime in the grocery store!! 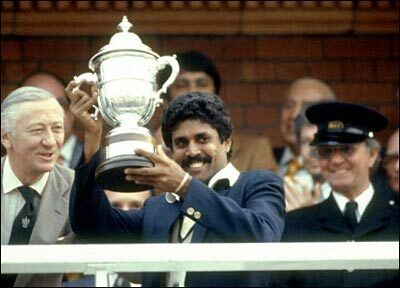 1983 is quite a long time back, and all that I know about India lifting the Cricket World Cup is from the iconic still in which Kapil Dev holds the trophy in Lords. Fast-forwarding 20 years, I was in the cross-roads of writing the MOST_IMPORTANT_EXAM of my life, the 12th standard public exam. In spite of that, I saw all the matches that India played. India had an humiliating defeat vs Australia in the qualifying round and went on to win everyone(England, Pakistan, New Zealand, Sri lanka to name some) else convincingly. 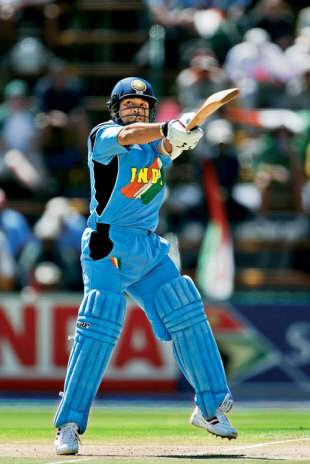 Some of the most memorable matches were played in that world cup series, The hook shot from sachin in shoib's over(India vs Pakistan) etched in the minds of the people forever. It is comparable to the Aamir Sohail's wicket take n by Venkatesh Prasad in the 1996 world cup!! We were basically cruising in that world cup, only to meet Australia in the finals. I had my Computer Science public exam the next day and to my horror saw India getting pelted by Ponting and his men!! I could see India loosing their hold on the World cup and myself on the computer science exam. 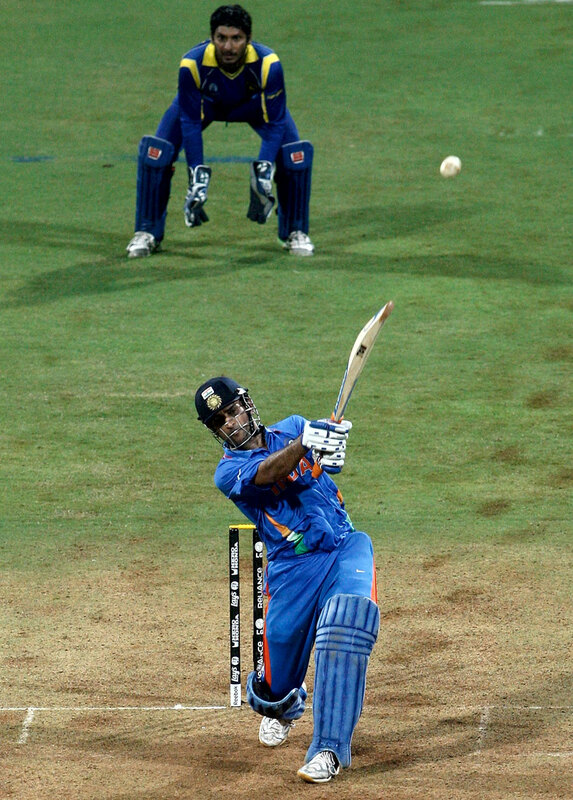 Under Dhoni, India lifted the 20-20 world cup in 2007, CSK lifted IPL - 3rd edition. Again it was the time for the World Cup in 2011 and initially, India tied/lost 2 matches but qualified easily for the quarter finals against Australia. Till then, I followed the world-cup only from the newspapers. Now the heat was on, though it was tempting, I resisted and followed only in Cricinfo that too the second half of the second Innings. Yuvaraj and Raina took India safely and knocked Australia out of the series. It was a sweet revenge for the the loss we had in 2003. I was more than happy and the next hurdle was Pakistan in Semi-finals. The media and the politics involved took the match between India and Pakistan to the next level and inadvertently created unwanted pressure on the players on both the sides. Being Superstitious esp in cricket, I followed this match too in cricinfo and it was real fun to see the status updates in FB and Twitter. And so we moved to the finals, the celebration back in India knew no bounds, and I dutifully saw them in youtube, what else I could do? Our generation never knew how India celebrated in 1983, but I am sure it would not be anywhere close to this. The venue for the final clash between India and Sri Lanka was Mumbai and SriLanka played first and possed a formidable score of 274!! India lost sehwag and sachin by 32 and the future looked bleak. Thankfully I didn't follow this and was sleeping peacefully paying heed to my superstitious beliefs. And when I got up and checked cricinfo, Gambhir and Dhoni was slowly but steadily closing in the gap. I knew that India is making history this time and I couldn't suppress my curiousity anymore. I started watching the match in some streaming channel. Inch by Inch we were closing on, though we lost Gambhir. Yuvraj kept the required run rate low while Dhoni was rotating the strike. When we had 11 balls and 4 runs to win, Voila!! Dhoni's finished the match with a SIX!! He scripted the masterstroke with his infamous Helicopter shot and made History!! India is now the World Champions and lifted the 2011 World Cup!! The stadium/celebration was electrifying. The 28 year wait finally paid off and we lifted the cup in India, happiness and excitement knew no bounds. Sachin's resume is complete and Dhoni is the best Indian captian of all times. Kapil Dev's 1983 world cup trophy brought the passion for cricket into this country, Sachin's 22 year crusade in Indian cricket made young/old, rich/poor, men/women to closely follow the sport. Dhoni's 2011 world cup is a dedication to the 1.2 billion hearts which beat together irrespective of the differences in language/custom/religion, whenever India played. Never before in the whole history of mankind would one-sixth of the world population would have completely forgot everything and jumped up in joy and celebrated. The celebration was not confined to India alone, the NRIs across the world celebrated and took to the streets. The whole world felt a lot lighter that day!! Sometimes out of the blue after blotting the door and while walking down the staircase, the heart perturbs and quips "Have you switched off the lights in the Living Room?" Ok, here I go to check it out and everytime it would have been properly switched off. But sometimes one tend to fight against this intuition and go forward but end up regretting later. With a huge plan in the mind for the weekend, I got myself ready on Saturday morning and was about to leave for the Eleven Mile State Park. As usual the intuition told me to take a pen along with me. I laughed at my Intuition thinking, 'why would anyone need a pen in the Isolated Prairie grassland, when there is a Frozen Lake to play with and the snow clad rocky mountains in the horizon to look at.' Probably taking some water with you makes sense and having woolen gloves is prudent enough in case the temperature dips. As I traveled the distance, the last 15 miles was indeed on a isolated gravel road with scenic spots on either side. Through the green grasses here and there have started showing their finger to winter, the overall outback was still yellowish brown. After a bumpy 15 mile drive the Eleven mile lake started unraveling itself. The board at a distance beckoned us to the state park and some instructions that were listed there. "Pay the Park Entrance Fee here" caught my eye, and a careful reading told that we had to fill-up a Entry form and pay the fee in the "Hundial" kind of a box, stick part of the entry form on the vehicle and only then we could enter the park. Sounds simple, no queues, no manned hazzles etc. Ok, Out I go to fill-up the form, and checked my shirt & pant pockets. Nope, Nobody had a pen. Probably in the car, no luck there too. Probably we could wait for another 5 - 15 minutes, Nobody in sight, As the Spring hadn't fully set in, nobody really cared to pitch in their tents in the midst of a frozen lake. And so after a 20 minute wait, we drove back disappointed (Pona machan thirumbi vanthaan). For the next 20 miles or so there wasn't a shop to get a pen and after covering that distance, we weren't in a mood to go through the bumpy gravel road again. Pay heed to the intuition it helps. While coming back was thinking about what my father used to say everytime I went somewhere outside "Enga ponaalum oru penna (Read Penn as ezhuthukol :) ) eduthundu po"
Netflix being the only pass-time, I watched some not so famous foreign language films recently. Some of them turned out to be really good. The direction and the acting are a class apart from the stereotypes. would add more to this list as I get to know them. After I started off with my masters, I couldn't find much time to pour in my thoughts and the happenings around, but the last one and half years have been replete with so many happenings and I would like to etch it here before it gets disappeared in the sands of time. I made so many friends here and I am sure most of them are a bond for the whole of the lifetime. Fall'09: Who am I? Where am I? The Bangalore gang's midnight walk to the HSC and back to Chapin soon after we came to SUNY-SB. The first trip to New York City and calculated spending on each and everything. Trip to Richmond. The trip in the college bus to buy groceries @ Pathmark & Walmart, followed by the visit to Smith Haven Mall to do window shopping. The trips to Desi store which provides the pick-up and drop service. The daily cooking with Rajesh in the evenings. The consecutive and consistent night-outs for OS projects has inculcated the insomniacal practice and now its really tough to sleep anytime before 3:00AM. Listening to Prof.Erez Zadok's Operating System lectures. Probably after my schooling this is the first time I listened carefully to all the classes with ultimate concentration. The part-time web-designing job and with that I opened some kind of an money inflow in Dollars here in US. The Pot-Luck Lunch & birthday parties filled with josh, dance and gameplaying. The tightly packed days with no free time even on weekends really made one to think how much time we had wasted earlier in life. And so the semester ends with the back to back OS & Algos final exams on the same day and the horrible preparation I did in that regard. Understood it is prudent to take courses which one can handle than stuff oneself with complex courses and try to learn something out of it. Also learnt that the best place to study is the HSC library after the end of the finals!! Waded through the severe winter winds to the lab during the winter holidays and got appointed as the Research Assistant in Seclab. Trip to Montauk Point & Washington DC. Ate outside almost all the weekends and covered almost all North/South Indian restaurants in Bay Area. routine weekend visit to Castro street in Mountain view for eatery. We finished the sunday night with a footlong at the subway, in san antonio shopping mall!! Visited Google Multiplex, Shoreline Blvd Lake, Marin headlands, Lake Tahoe, Stanford University, Napa & Sonoma valley, Half Moon bay to name a few. The gruelling days with the search for full-time job and added to that the Network Programming projects and Comp bio assignments and project. Trips to places across US for job interviews, and secured the job with LSI. Hurray!! Completed the last exam of the Master's program. Trip to Atlantic City and lost money in Casino!! New Year's eve with SBU group in New York City. Dinner at Hotel Saravana Bhavan. Jan 1st 00:00 2011 at Brooklyn Bridge!! Visit to the infamous American Museum of Natural History, NY and Rockefeller Center. Trip to New Jersey with Subbu and meetup with Kumaran. Stunning views of NY skyline from Newport. Successfully completed the work at Seclab and bid adieu to SB and NY. It might be just a timespan of just one and half years but lot has happened within that time. With my head held high, I would say proudly that I am an Alumni of State University of New York, Stony Brook. Coffee alias Kaapi is a good thing, infact the best of things. Though the transition from 80:20 chicory blend coffee in a stainless steel tumbler to Starbucks french roast coffee in a microwavable cup has taken place, it still amuses me. When I was told that coffee found its way into India from Arabia, through the sufi saint Baba Budangiri only in the 1600s, I couldn't digest that fact, who could have? Coffee and Tamil Brahmins are inseparable and I grew up for around 20 years drinking the Madras style Filter Coffee. And I could not think of a lifestyle without coffee, prior to 1600s. Similar to the English style Tavern, The Coffee Houses sprung across India in the late 1700s. The Iconic Indian Coffee House setup in the early 1900s is still patronized by many. True to the phrase "Old wine in a new bottle" Cafe Coffee day et all sprang up recently adding more hip to it. When I used to getup early to prepare for exams, and with a coffee cup in hand I used to think that someday, I should wake up early and enjoy this coffee seeing the sunrise, without the tension of exams or hurry-burry. Also having hot coffee on a dark rainy day afternoon sitting in the portico had been on my wishlist for long too. Someday... Someday. Some times, even if the coffee is bad, it is the company of people and the environment which makes it heavenly. The cherished ones in my life include the coffee time chats with Vineet, Bharat and Amber @ HP, the 2 hour pattrais @ Annan Kadai in Madurai with Sens, Sri, Subbi, Musi & vanni. the all-alone coffee times in CCD, madurai and bangalore. The best coffee include the Madras style tumbler coffee @ my home and the one in Murali Kaapi Kadai, Srirangam. PS: While I had just spent time for a blogspot about Coffee, Mark Pendergrast had written a whole book on coffee "Uncommon Grounds: The History Of Coffee And How It Transformed Our World"